Intuit Workers' Comp Payment Service is currently available in all supported versions of QuickBooks Desktop Payroll. From the QuickBooks Desktop Home Page, click the HR Essentials and Insurance icon. Select Workers' Comp Payment Service from the drop down menu. Fill out the form and click Get Quote. Once you've signed up, complete a few tasks to get your payroll set up to do your workers' comp payments. Get the latest payroll update. Set up your Personal Identification Number (PIN) if you do not have one or confirm your PIN if you already got one. 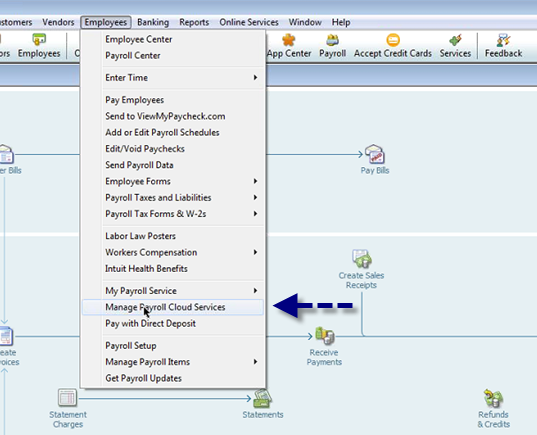 Go to the Employees menu at the top of your screen and click Manage Payroll Cloud Services. 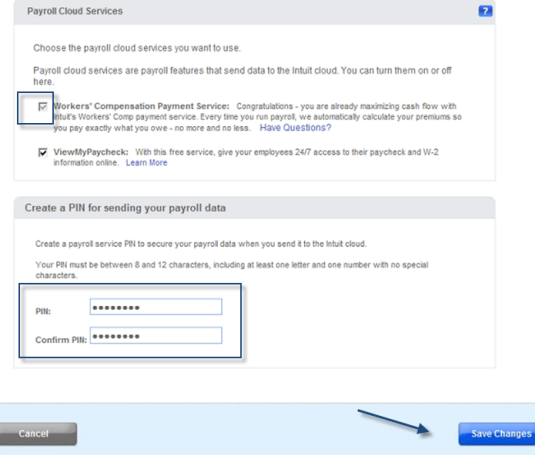 Make sure the Workers' Comp Payment Services checkbox is selected in the Payroll Cloud Services window. If not yet selected, select the item. Enter your PIN. Your PIN must be between 8 to 12 characters including at least one letter and one number with no special characters. 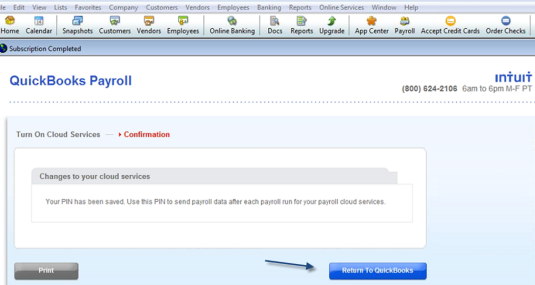 On the Confirmation page, click Return to QuickBooks. Tip: If you use Assisted Payroll or Direct Deposit, you don't need to create a new PIN--just use the PIN you've already created to send your workers' comp payroll data to us. 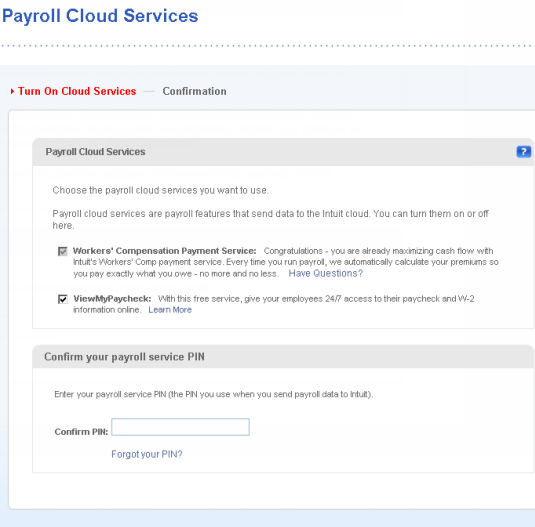 Go to the Employees menu at the top of the screen and click Manage Payroll Cloud Services. Verify that your Employees and their Work States are set up correctly. In QuickBooks Desktop, click Reports > Employees & Payroll > Employee Withholding. Verify that all employees subject to workers' comp are listed on your report. Review the report and make sure all info is complete and correct. Do not leave any info blank or (none) -- it affects how your workers' comp gets calculated. Edit your employees' info if necessary until the report is accurate. From the Employees menu, click Employee Center. On the Employees tab, double-click the employee record you want to edit. Review the employee's First Name and Last Name. Update the name when necessary. Make sure that the Employee is inactive checkbox is clear. If otherwise, the employee will be missing in the Employee Withholding report. In the Edit Employee window click the Payroll Info tab. In the State Subject to Withholding section, click the State drop-down arrow and select the state where the employee lives. 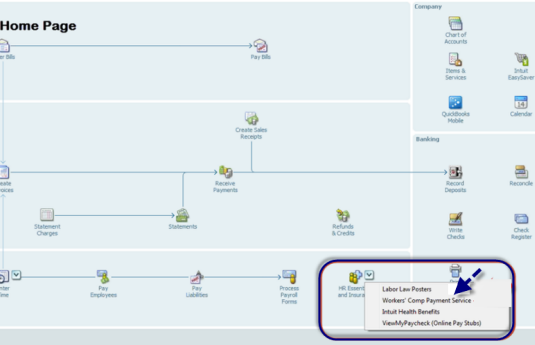 In the State Worked section, click the State drop-down arrow and select the state where the employee works. Select the SUI (Company Paid) checkbox. Click OK to close the Taxes window, then click OK again in the Edit Employee window.Make the necessary edits for all of the employees. Open the Employee Withholding report again, and review the data you just updated. Verify that your workers' comp payroll items are set up correctly. In QuickBooks Desktop, click Lists > Payroll Item List. If you create a new Payroll Item, then delete the old (incorrect) Payroll Item. Important: When you change Payroll Items that effect workers' comp, they'll be sent next time you run payroll. But any previous payroll runs won't be corrected automatically. To make corrections, contact Workers' Compensation Team at 888.859.3914, 6AM-5PM PST, Monday through Friday. How do I send my workers' comp payroll data to Intuit? Send your payroll data to us. If you use Assisted Payroll or direct deposit, STOP HERE. Your data gets sent automatically, so you don't have to do anything. When prompted, click Send Data to Intuit. Tip: If you accidentally closed the Send Data window, click Employees > Send Payroll Data, then go on to Step 2. In the Send/Receive Data window, click Send. Enter your PIN and click OK. Wait for the message that your Payroll transmission has succeeded. Review Items Received in your Confirmation report. If you see Error in your Confirmation Report, click View and follow the instructions we give you. You can also upload prior (also called historical) paycheck info. To do so, in QuickBooks Desktop choose File > Print Forms > Pay Stubs, pick the date range you want to include, and then click Send Online.